Perform some action on a List control (e.g. refresh the List, etc) in a UX Component. Perform an Ajax Callback to the server to refresh the data in the List. Perform an Ajax Callback to refresh the data in the child List(s) for a particular List. For example, the current List might show a list of Customers. This List might have a child List that shows Orders, and the Orders List might have a child List that shows OrderDetails. If you perform this action on the Customers List, it will update the data in the Orders List and the OrderDetails List. Perform an Ajax Callback to refresh the data in the current row. This action is only meaningful if the List was populated with data that was computed on the server. For example, if the List data source is SQL, DBF, Custom, etc. Perform an Ajax Callback to refresh a specific row of data. The row to refresh is specified by the primary key value. Perform an Ajax Callback to navigate data in the List. You can specify First, Next, Prev, or Last as the target page. This action is only meaningful if the List was populated with data that was computed on the server and if pagination was turned on in the List definition and the pagination method is set to NavigationButtons. For example, if the List data source is SQL, DBF, Custom, etc. Perform an Ajax Callback to navigate data in the List. You can specify a target page number. For example, page 3. Perform an Ajax Callback to fetch the next page of data for the List. The number of records that are fetched is determined by the setting for the Page Size in the List definition. This action is only meaningful if the List was populated with data that was computed on the server and if pagination was turned on in the List definition and the pagination method is set to FetchMore. For example, if the List data source is SQL, DBF, Custom, etc. Perform an Ajax Callback to fetch a record specified by a key value. You can specify multiple key values. The fetched records are appended to the List. Filers the records shown in the List using a client-side filter. No Ajax Callback is made. Perform an Ajax Callback to filter the data shown in the List. Sorts the data in the List. The sorting is done in the browser - no Ajax Callback is made. Sorts the data in the List and adds group breaks to the List. You can define headers and footers for each group break, and you can define multiple levels of grouping. You can also include summary data (such as the number of rows in a group or the total for a column in the group) in the header or footer. A client-side sort is performed on the List data. This action is a super-set of the Client-side sort action. 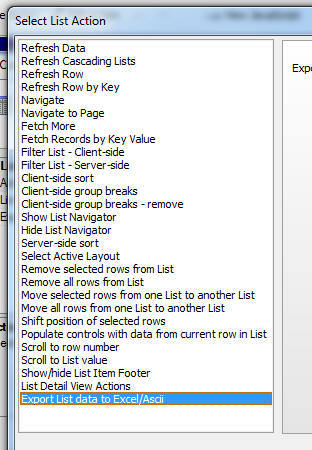 The List Navigator is a scrollable window with a list of all the Group Breaks in the List. You can quickly scroll to a section of the list by dragging on the List Navigator. This action is only meaningful if the List has group breaks. These group breaks can either have been defined as server-side group breaks (in the case where the List data is based on a SQL, DBF, or Custom data source), or client-side group breaks. Hide the List Navigator if it was previously shown. Perform an Ajax Callback to sort the data in the List. If you have defined multiple Layouts for a List, this action allows you to select which Layout to make active. Removes the currently selected rows from a List. If the List has been configured to allow multiple rows to be selected, then this action will remove all of the rows that are currently selected. Clears out all rows in the List. Moves the currently selected rows to another List. Moves all the rows in a List to another List. Moves the currently selected rows in a List. You can specify the following moving directions: Top, Up, Down, or Bottom. Populates controls on the UX with data from the current row in the List. For example, assume the List has these columns: Firstname, Lastname, City, and State. Assume that you have placed textbox controls on the UX with these names: FN, LN, CITY, and STATE_REGION. This action will set the value of FN, LN, CITY, and STATE_REGION controls with the data from the current row in the List. Click here to download a component that demonstrates populating text boxes with the data from the currently selected row in a List Control is selected. Scroll the List so the specified row number (zero based) is scrolled into view. Scroll the List so that the row with the specified value is visible. For example, if the List has been configured to return values from the Lastname column, you can specify Smith as the value to scroll to, and the row with the Lastname value of Smith will be scrolled into view. If you have defined a List Item Footer, this action will toggle the visibility of the footer, or explicitly show or hide it. If the List was configured to have a Detail View, this action allows you to perform some actions on the List's Detail View. Saves edits to the record in the detail view to the List. Synchronizes edits made to records in the List to the server. Enter a new record using the List Detail View. Reset the Detail View Form, undoing any changes made to the record. Undo the changes made to the current row in the List. You can export data in a List control to either Excel or to Ascii files. Select the 'Export List data to Excel/Ascii' action from the list of available actions. Click the smart field to define the 'Export list data settings'. In the case where the List is based on a SQL query, the builder shows the 'Export what' property which can be set to 'Data in List query' or 'Data shown in List'. If the 'Export what' property is set to 'Data in List query' the 'Maximum number of records to export' property is shown. In the case where the 'Export what' property is set to 'Data shown in List' or if the List is not based on a SQL query (in which case the data that is exported is always the 'Data shown in List'), the 'Customize field sizes and column heading in export file' property is shown. The 'Customize field sizes and column heading in export file' property is only shown if the 'Export format' is Excel. This property allows you to customize the column headings in the Excel file and control the data types of the data in the excel file. To customize fields, click the smart field for the 'Customize field sizes and column heading in export file' property. A build opens up where you can enter a CR-LF delimited list of definition - one for each field you want to customize. The syntax for the definition can be shown by clicking the 'Show syntax help' hyperlink. The syntax allows you to specify the data type, size and column heading of each column in the Excel file. Specify the List Action that you want to execute. See Available Actions above for a description of each available action. Specify the List you want to perform an action on. Export list data settings property. Specify the List(s) you want to perform an action on. You can enter a comma delimited list of ListIds if you want to refresh the data in more than one list in a single Ajax callback. Specify the direction in which you want to navigate. (Only applies to Lists that are set to paginate data). Choices include First, Previous, Next, Last. Specify a comma delimited list of key values for records you want to retrieve and add to the List. The list of keys is CASE SENSITIVE. If the primary key of a record has multiple columns, separate each segment of the key with 3 pipes (|||); e.g. John|||Smith. To retrieve the records for customers 23, 57 and 35, enter 23,57,35. Specify a comma delimited list of key values for records you want to refresh. If the primary key of a record has multiple columns, separate each segment of the key with 3 pipes (|||); e.g. John|||Smith. To retrieve the records for customers 23, 57 and 35, enter 23,57,35. If a key value specified here is not currently in the List, it can optionally be added to the List. See the 'Add to List' property. If a key value that is specified in the 'Records to refresh' list is not currently in the List, it can optionally be added to the List. Specify the name of the control that contains the value to search for. Client-side group break definition property. Chose 'Simple' if you only want to sort on a single column. Choose 'Advanced' to sort on multiple columns. To sort AND group the data, use the 'Client-side Group Breaks' action. Choices include Simple, Advanced. Client-side sort data type property. Choices include Default, Number, Date, Logical, Character. Specify the sort direction. None will remove the sort. Choices include Ascending, Descending, None. Specify the column number (1 based) of the column you wish to sort on. If the List has previously been sorted on this column, the sort direction is reversed. Specify the Id of the target List. Specify the direction in which the selected rows should be shifted. Choices include Top, Up, Down, Bottom. Specify the row number to scroll into view. First row is row 0, second row is row 1, etc. Specify the row to scroll into view by specifying the return value of the target row. For example, if the List is configured to return the value in the Lastname column, you could specify 'Smith' to scroll the row that contains a value of 'Smith' for the Lastname field into view. Save the edits in the detail view to the List control. Save the edits made to the List back to the server. Reset the detail view, undoing all edits. Undo all change to the currently selected row int he List. Mark the currently selected row in the List as deleted. Provides tips for creating enable expressions that can be added to buttons that invoke the action, e.g. enabling a "Reset Detail View Form" button only when the Detail View is dirty. If enabled, the user will be prompted to confirm the action before it is performed, i.e. when deleting the currently selected row. Should the target row be positioned at the top or bottom of the List, or simply scrolled into view. Choices include into-view, top, bottom. Distance from top/bottom of List to scrolled to item. Distance from left/right of List to scroll to item. Specify if the visibility of the element should be toggled, or explicitly set to shown or hidden. Choices include ToggleVisibility, Show, Hide. Specify which row to operate on. The first row in the List is '1' (not 0). To operate on the row that has focus, enter <Current> or leave blank. An explicit value greater than zero specifying the animation speed in milliseconds. E.g., 500. If enabled, focus on the current row will be retained when the List control is refreshed. Child lists will also remember their current selection. Set focus to row with specified value after List is refreshed. You can leave this value blank. Specify if the child lists should be refreshed. Only applies to Lists with child lists. Specify if only the child lists should be refreshed. The parent list is not refreshed. Only applies to Lists with child lists. An incremental refresh will not overwrite edited rows in the List. New records added on the server after the List was initially populated will be retrieved. Records deleted on the server will be removed from the List. Records edited on the server will will be updated in the List (as long as these records to not have unsynchronized edits). When you do a full refresh, unsynced List edits are lost. Therefore you should check that the List is not dirty before doing a full refresh. Specify the message to show if an attempt is made to refresh the data in a dirty List.